The other day I was talking to a friend and the topic of chocolate chip cookies came up and I realized that it had been far too long since I had last made any. Although the tried and true basic chocolate chip cookies are always welcome, I like to play around with the recipe adding different things like nuts and/or dried fruit. I picked up a large bag of dried cherries a while ago and I remembered thinking that cherry chocolate chip cookies would be really good since chocolate and cherries are such a great flavour combination. I started with my standard chocolate chip cookie recipe and I pretty much just added some dried cherries. At the last minute however I decided that I wanted the cookies to be a bit more chocolaty and I replaced some of the flour with cocoa powder. When I make chocolate chip cookies I prefer to use a good dark chocolate which usually comes in bar form which I cut into chunks rather than just using chips. The cherry chocolate chunk cookies turned out great! They were not as dark as I was expecting but the chocolate flavour was nice and strong and it paired well with the cherries that added a pleasant chewy texture to the cookies. The cookies were slightly crispy on the edges and soft and chewy in the center. Mix the flour, baking soda, salt and cocoa in another bowl. Mix in the chocolate and the cherries. Bake in a 350F/180C preheated oven for 10-14 minutes. Oh, boy … these will make an appearance at my next party, whenever that will be! These look great! I had a really great cookie at a potluck and it included dried cherries and walnuts, SOOO good! I think it was an Alton Brown recipe. I love cherries and I love chocolate 🙂 These cookies will be made in my kitchen soon!!! I love the addition of the dried cherries in there. Yum! Yayyyy, dessert! Your cookies look perfect. I love the presentation as well. What type of chocolate did you use? Look and sound yummy – think I am going to have give this one a try as my son loves cherries. 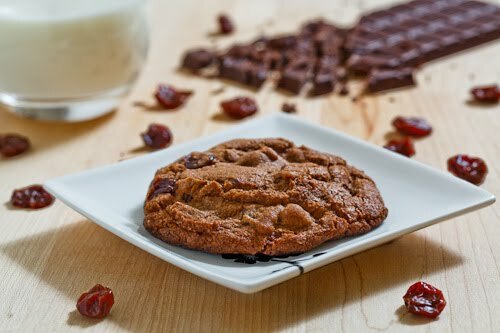 I'd love to find dried cherries here… What gorgeous cookies! I've been on the subject of chocolate chip cookies, too, for the past week! LOL! even offered to give two amazing packaged cookies away in exchange for a good homemade recipe. Looks very crunchy and delicious. Would love it with a cup of milk. Cherries and chocolate, just perfect and delicious. Great combination Kevin. I put cocoa in my chocolate cookes too. Will have to look out for some dried cherries. So yummy! I bet they would also be great in brownie form! I prefer dark chocolate as well in my chocolate chip cookies. Cherries and chocolate are such an great combo. I will have to give these a try. oh what yum! perfect combi. I am going to save that one! I love my chocolate chip cookies soft and chewy in the centre so I could never turn one down Kevin. 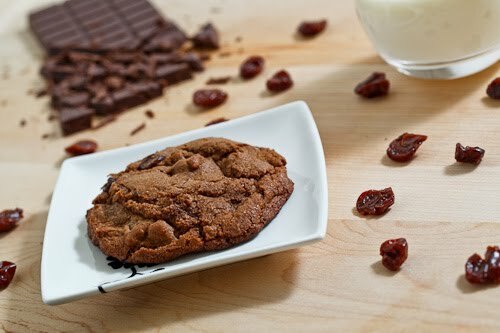 Cherries and dark chocolate are such a delicious flavor combination… these cookies look fantastic! These are choco chip cookies made even more special! These sound delicious!! Love the chocolate and cherries thrown about!! you can deliver these to me right now! Yum! I tried out a Lindt chocolate with cherry and chile filling last night. Quite delicious! Years ago I discovered that by purchasing black cocoa, instead of regular grocery store or even gourmet cocoa powder, that I would have a much more appealing product. Black cocoa is what makes Oreo cookies look so chocolatey, whereas home baked chocolate desserts often look reddish or anemic, no matter how much cocoa you add. Just substitute half of the regular cocoa with black cocoa (or more) for a dark, rich color. If you use all black cocoa, you may well find that your baked goods are TOO dark. Bon appetit. Sorry, I need to clarify my earlier statement about black cocoa. Whether you use black cocoa powder or regular cocoa powder, the amount always remains the same in your recipe. Using only black cocoa, however, will make your baked goods extremely dark (so you need to combine regular and black cocoa to get the results you desire). You can purchase black cocoa already mixed with dutch processed cocoa, usually a 50/50 blend. I prefer, however, to buy them separate and use 75/25, with the bulk portion being black cocoa powder. (By the way, it makes the best hot cocoa). Anonymous: I am definitely going to have to look for black cocoa! Thanks for the tip! What dried fruit could possibly work more beautifully in chocolate chip cookies? I surely can't think of any. These cookies are fabulous! I plumped my cherries in rum which gave them a nice, subtle kick. Next time I'd like to try kirsch! This combo of chocolate and cherry sounds like an amazing mix!! Delicious!! I didn't have any cherries, so I used cranberries instead. Cookies turned out great! You have some great recipes. I only just started, but I'm planing on trying quite a few of them.